A timber home was not in the cards when Dr. Warren Wolfe and his wife, Diane, decided to sell their New Jersey home of more than 30 years and head south to live closer to their children and grandchildren. The original plan? To buy a resale house in one of Washington, D.C.’s quiet suburbs. Unable to find a home that suited them, the couple purchased a wooded property about an hour farther south outside historic Fredericksburg, Virginia, in Spotsylvania County’s Fawn Lake community. Diane, an interior designer and jewelry maker, made it clear that, if they were going to build from scratch, it had to be her dream house. That meant a timber home. “We spend a good deal of time in Colorado, where gorgeous timber homes are everywhere. 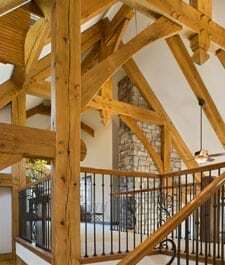 The look of hand posts and beams really appeals to me,” she says. After months of researching and evaluating plans from various companies, one, with an exterior resembling an old Old-World cottage and an interior view blew Diane’s mind. The dealmaker: the “Tuscany” from Riverbend Timber Framing. She immediately got in touch with Paul Krause, a Riverbend representative in New Jersey. “We met with Paul to explore the plan’s options and to discuss the features we wanted in our home,” says Diane. “I also gave him an initial floor plan I had created myself.” Diane’s plan included a dramatic view, great room, a spacious kitchen and dining area, a suite and studio space on the main level. The second story was divided into a guest bedroom, a loft with a sitting area and an office in which Warren could work while enjoying the wooded views surrounding him. The unique bridge that first caught Diane’s eye remained unchanged, naturally. Marty Birkencamp, Riverbend’s design department manager, created a concept sketch that forged the original plan, Diane’s modifications and the land’s deed restrictions into a workable design.“Warren and Diane made a smart decision to build a hybrid house, combining an oak timber frame with energy-efficient Insulspan structural insulated panels,” says Marty. “For additional energy savings, they chose Riverbend’s Advantage ICF System of expanded polystyrene blocks and concrete for their foundation walls.” The home’s overall look is the same as a traditional timber structure, but the innovative combination meant fewer drafts and a more comfortable home. “An experienced supervisor from Riverbend came out to oversee the raising,” notes Diane. “The house was under roofing in less than two weeks.” Eighteen months later, the Wolfes moved in. To see more pictures of this timber frame home view the gallery, Fredericksburg, Virginia Residence.